Canada's women's soccer team is a few months away from the FIFA women's World Cup in France this June but is ready for what seems like the long road ahead. While the Canadians are two-time Olympic bronze medallist, their best finish at a World Cup was a quarter-final appearance in 2015 on home soil. On Tuesday, Canada, which is holding training camp in Rota, Spain, plays a friendly against the Netherlands before heading off to Portugal to compete in the Algarve Cup next month. Veteran midfielder Sophie Schmidt spoke with CBC, detailing the team's preparations for the ultimate tournament in France and life after John Herdman. CBC Sports: There were so many changes to the women's national team since the last World Cup, including a new coach. How would you describe the character of this team going? Sophie Schmidt: I think we have a lot a lot of similar faces that we've had in the past but also an infusion of young guns; experienced young players as well that have had some experience under the belt of the World Cup. There's just a lot of life in this team. There's some great energy and we have a very ambitious group of girls led by, I think, a coach that is expecting a lot out of us. CBC Sports: John Herdman was such a fixture for the team and brought the women's team far. How is is it different working with your new coach, Kenneth Heiner-Møller? SS: It's amazing. I think he has a different energy than John does but I think it works perfectly. John was what we needed for that period of time and he got us where we are now. It's just like a transition right now. It's more free flowing football and attention to the details but kind of letting us kind of make it our own as we go because we had that structure through John, and now it's kind of like finding that fluidity. CBC Sports: What are the strengths of this team? SS: We have some really fast players. I think one of our our strengths is definitely that we have some technical players as well that can find those players in the space which can be a threat. I think one of the biggest assets we have is how defensively compact we are and hard to break down. Even if other teams are well equipped, they are going to have to come with something special to break us down. I think that's one of the biggest assets we have is that we can be so defensive and then go and attack quickly and be very dangerous. CBC Sports: Germany and the U.S. are two of the best teams in the world. How does Canada's game stack up against them? SS: Germany and the U.S are the standard right now in women's soccer and they have been for a very long time. I believe that we've closed the gap on them … we're right there. I think we could potentially beat either team on any given day. We have the structure of the organization, as well defensively, the power going forward. It's just a matter of bringing all of those things together for a peak performance for the big main event. I think it helps that a lot of our players have had some big tournament experiences and they know what to expect because under pressure, that's when it counts the most. As much as we can minimize our mistakes, that's going to make the difference between winning and losing. CBC Sports: Is Canada still an underrated team? SS: I think a bit, yeah, because if you were to ask other teams who they think are the best in the world, they would easily rattle off Germany, the U.S. or France as one of the top competitive contenders as of right now. I think that we get forgotten about because I just don't think we've been on the scene that long, or they underestimate us, or we fall just under the umbrella because of the U.S. But I think that we're right there and should be taken seriously because we can win against any team on any given day. CBC Sports: The Algarve Cup is sometimes called the "mini World Cup" (an invitational tournament of 12 teams). How important is it for you to perform and show off those assets before the actual World Cup? SS: It's our last tournament test before the the real deal come summer. We need to learn to get the win no matter what. Because at the end of the day it doesn't matter how beautiful you play soccer, if you don't get the two points or make a pass, it doesn't matter. The Algarve Cup is a perfect opportunity for us to practise that but also to make sure that we're in the right place, physically, so we can treat it as a proper tournament environment. CBC Sports: The entire team is at training camp in Spain right now and you came together from all kinds of leagues in a few different countries. How is it coming together? SS: We kind of have our philosophies in place. Our coach has done a great job of making sure even though we're out of the environment, we still have meetings to go over tactics and to make sure that we're all doing the right thing and connected in that sense. 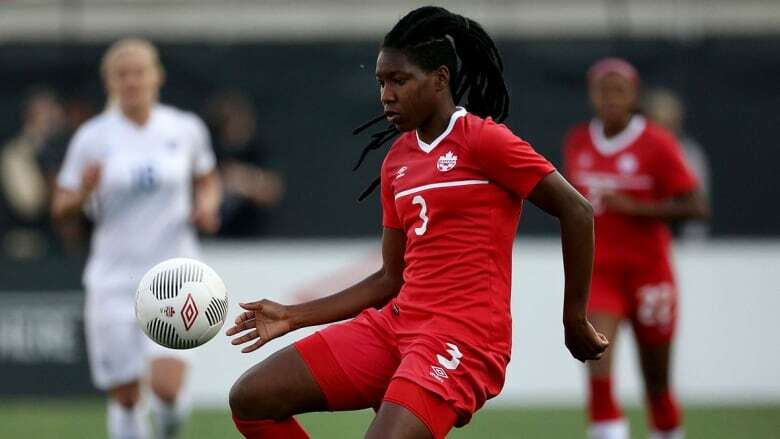 I think the beauty of it is that everybody has their own experiences: Ash [Lawrence] and Kadeisha Buchanan are playing in France, they're playing in one of the highest leagues possible. When we come together, our coaching staff makes sure that we're in the right space physically and mentally and raring to go. I think it only enhances our team in terms of experience and knowledge that they can bring to the game and to others to be part of those different cultures. CBC Sports: I'm not saying you're old, but you're one of the veterans on the team. What are you doing differently to prepare for this World Cup? SS: Yes, I'm old! I think I'm very intentional with my time. I think that when I was younger it was all, 'okay I need to put in more hard work to run more,' and put in that hard work but now I think more is not always better. It's about being efficient and making the most of your time. Now, when I am working out, I'm getting the most out of myself in that workout. A huge part of that is lots of recovery and making sure that my body is capable of handling the load. The other side of it is just the mental aspect of it; enhancing the visualization, meditation, because that's kind of my thing on the field, my presence. It's just more attention to the details and fine tuning instead of trying to do a thousand things right before [the] World Cup.